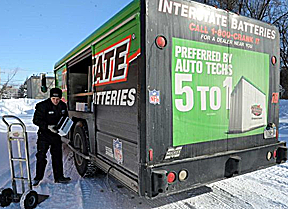 It’s been a brutally cold and snowy winter in the northeastern U.S., but thanks to Andy Breen, “the Battery Man,” motorists in the Upstate New York hamlet of Colonie, a suburb of Albany, are getting a “charge” out of the weather. Click HERE to read the story about Andy – a driver for Interstate Batteries for 18 years – that ran in the Albany Times Union. And notice the bright green Interstate Batteries truck that bears the Mickey logo on the body.